I recently attended a Rich Dad, Poor Dad wealth building seminar held by author Robert Kiyosakiâ€™s financial education team. While I didnâ€™t agree with all of the advice given (the seminar leader suggested using credit cards to pay for home renovations), there were some nuggets of wisdom that I thought were valuable. 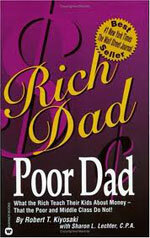 I recently attended a Rich Dad, Poor Dad wealth building seminar held by author Robert Kiyosaki’s financial education team. While I didn’t agree with all of the advice given (the seminar leader suggested using credit cards to pay for home renovations), there were some nuggets of wisdom that I thought were valuable. 1.Â Invest. This is one of the best ways to grow your wealth. Don’t bank on winning the lottery. Instead of faithfully buying lottery tickets each week, use that money to invest. Websites like Sharebuilder let you buy stock for as little as $4. If you don’t know how to invest, there are plenty of classes, books, and workshops you can take advantage of. Sharebuilder also has helpful educational resources on the site. Read the post “Play Games with Your Moneyâ€ if you want more information on learning how to invest. 2. Own property. This is one of our 10 Wealth for Life principles (Principle No. 5). At BE, we believe that homeownership is one of the foundations to wealth building. For example, a home can be rented out and turned into an investment property. As you build equity, a home is an asset that contributes to your net worth. 3. Use “good debtâ€ to your advantage. There is good debt and bad debt. Bad debt would be using a credit card to purchase a new Coach bag. Good debt would be taking out an educational loan to attend school. Additional education often means increased earning power. Another example is taking out a mortgage to purchase a home. 4. When you can, use other people’s money. On the flip side, don’t go into debt if you don’t have to. If you qualify for grants and scholarships to attend school, by all means go after them. And if you qualify for down payment assistance, apply for the program. 5. Know tax laws that apply to you. If you own a home business, learn what can and cannot be deducted. Or if you work for someone else, and you have to purchase items directly related to your work, know what can and cannot be expensed to the company. Don’t just give your money away. Many of these tips might seem like common sense, but many people don’t expense items that should be paid for by their company, and many more people don’t invest because they’re fearful. Are you one of them? Take some time to review this list. Are there some things you need to work on? Try to move toward practicing one of these tips today. Your wealth is depending on it. Sheiresa Ngo is the consumer affairs editor at Black Enterprise.